Can someone fill me in on what exactly an American girl (U.S. citizen, born in EY, renounced citizenship, does not have that paper) would need to bring/do to get a student visa? Where should she go? When? Is there, by any chance, somewhere online with this info? Thanks for replying. I haven't done it in many years. What is the regular process? Forget about the fact she was born in Israel, it's irrelevant. 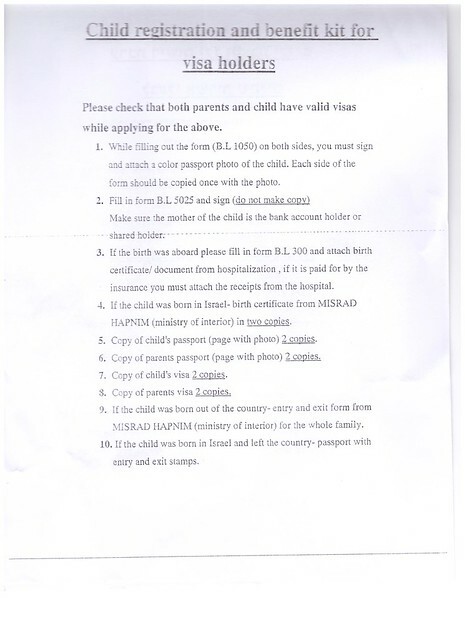 You bring your passport and letter from school to misrad hapnim (after getting an appointment). That's it. If the school is doing it for all the girls, do it with them. There is nothing special about your daughter vs any other usa-born american. Halevai they would do it for her, but it seems like they won't. Any info re when & where to get appt.? Thanks. You didn't mention passport pics. The wiki says that. Not necessary? 1 - "Passport of every household member": How does that apply to a single person studying there? I assume she does not need PPs of her parents in USA. 2 - Proof of student enrollment is easy enough (I hope!). How does she get proof of Yahadus? Does the school give that? 3 - Is this still accurate/recommended? "If you don't want to wait for months to get an appointment at the Misrad Hapnim, take note... There's a new Misrad Hapnim office in Har Choma... As of now, they are allowing people to come - without an appointment! - between 8 and 10 AM, any day of the week except Wednesday. So if you need a visa in a hurry, go before they change the rules..."
1. Correct, no need for anyone other than herself. 2. School letter should also say that she is Jewish. Standard procedure. Can an American bochur apply at har choma? What's the address of har choma location? You answered more than I did! Even Har Choma branch requires appointment first (for first-time visa applic's.) Renewal are w/o apt. הארכות ויזה - ניתן להגיע ללשכה כל יום חוץ מיום ד' בין 8:00-10:00 ללא תור. Can anyone confirm this lmaisa? I went last week with my wife for first time visa and we didn't need an appointment. Was it between 8:00 - 10:00 ?